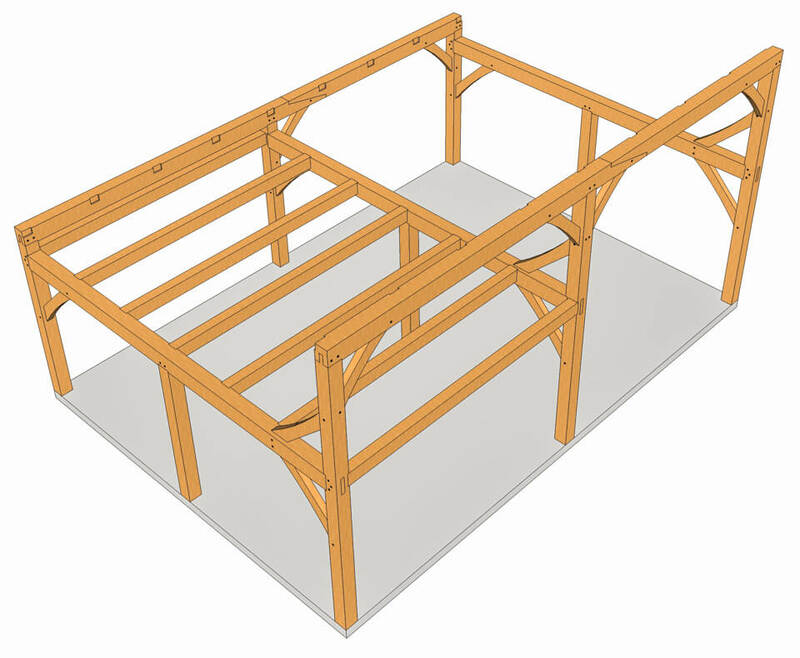 This 28×20 timber frame saltbox is designed with common trusses and collar ties, which makes the cutting and raising a bit easier for a good-size frame. The saltbox style creates a ceiling on one side that soars to 19’-6” if you leave the collar ties exposed, creating a wonderful high-volume space. The plan is designed with a loft over the other half of the floor space, creating an area you can use for a bedroom, office, or any number of uses. The saltbox style of house is a strong and simple one that has been seen in this country since the 1650’s. It’s a design with two stories in front and one in back. 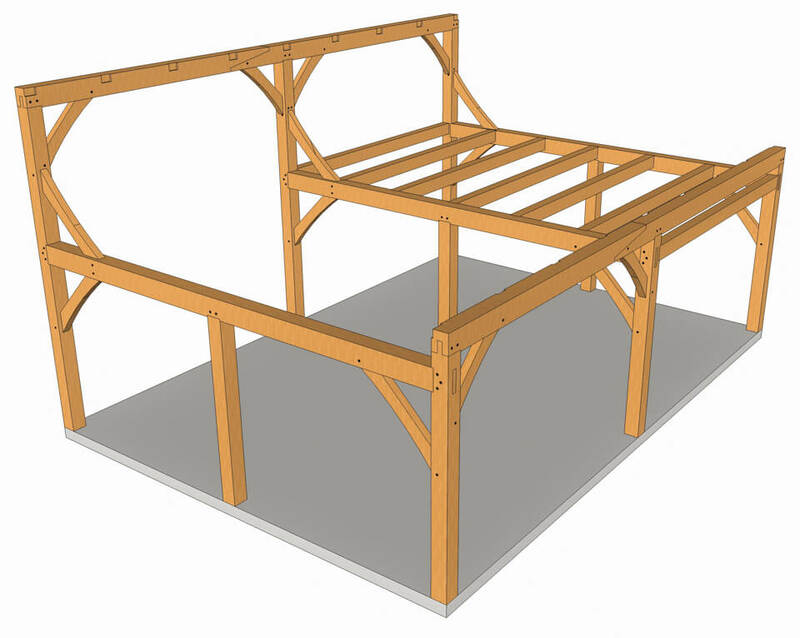 The roof pitch is short and high in front and long and low in back, creating a two story structure on one side. This 28×20 timber frame saltbox has 560 square feet on the ground floor and 280 square feet on the second floor, which gives you a total of 840 square feet of versatile space. 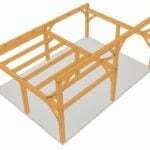 Use this for a barn with hay loft, or a cabin in the woods, or a garage with workshop loft! 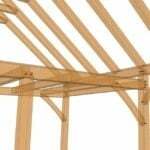 The drawings include fully dimensioned plans, elevations and sections, as well as detailed cut drawings of every timber in the structure. There are also three-dimensional renderings to help you visualize the finished product. 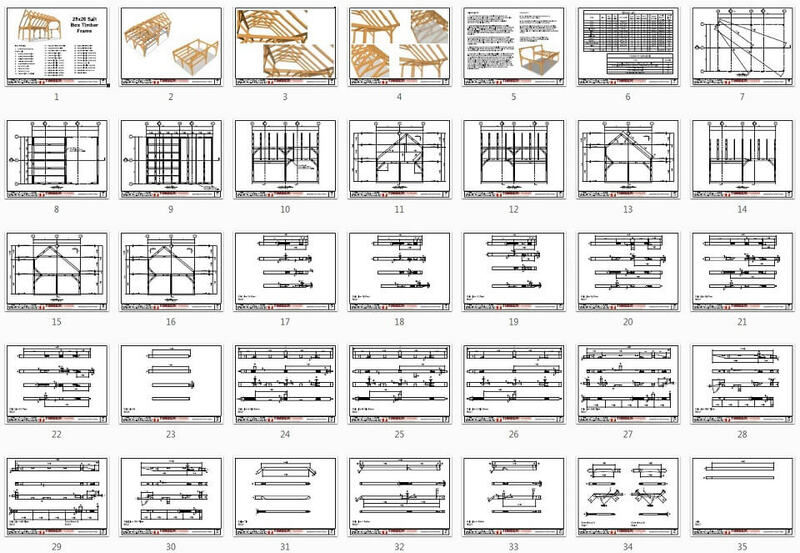 The plan set consists of 35 pages of thoroughly detailed drawings, including a timber list and fastener schedule (and you can purchase the fasteners right here at Timber Frame HQ! And for your convenience, the plans are formatted to 8 ½”x 11”, ready for instant download and printing from your home or neighborhood copy shop. 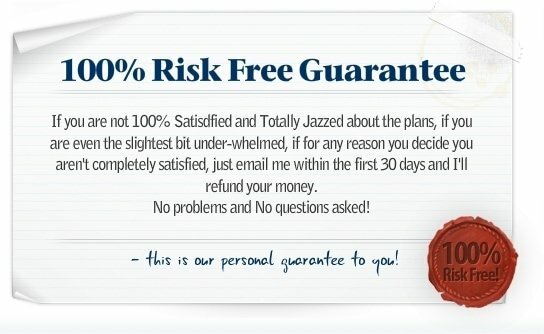 This website is a great resource! Glad I discovered it. Can you tell me the pitch of the saltbox plan, or if it is variable? It has a 10 and 12 roof pitch on both roof planes. Thanks very much! Food for thoughts about solar panels or roofing angle. Can the plans be flipped so the larger open area is on the left side instead of the right side? Yes you can easily flip the bents around and floor system. I’m looking for a cabin plan and am comparing this with your 20×24 Queen Post Plan with Loft. Can you please give a rough estimate of differences in build cost and ease of building? I’m in Australia – have you had any experience using the eucalyptus timbers? I have no experience with the building cost in Australia or eucalyptus timbers. 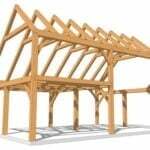 There is an article in the Timber Framing Journal Number 74 about a gentleman Rob Hadden that was building his own timber frame. 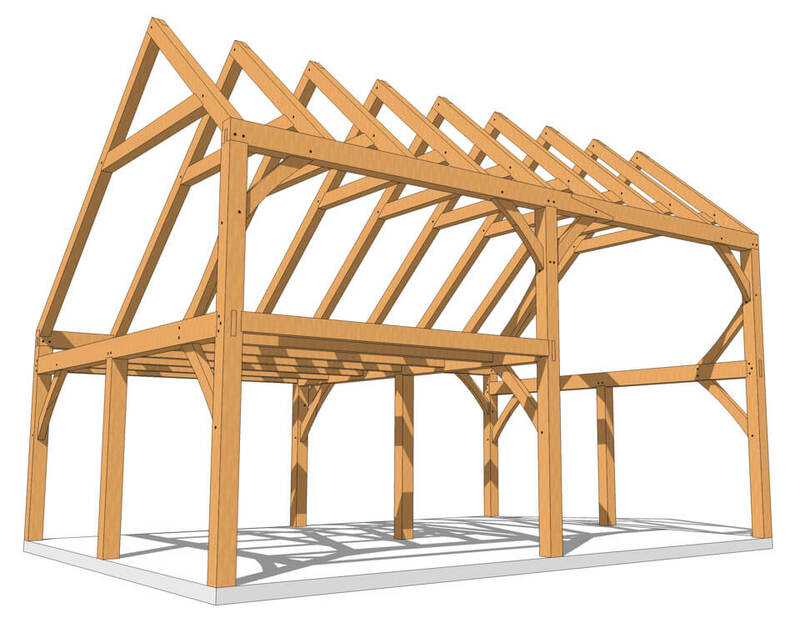 I would search out any timber framers in your area (it may be a big area) and talk to them. I bet they are more than happy to share their knowledge. Out of curiosity, what do you do for the walls? 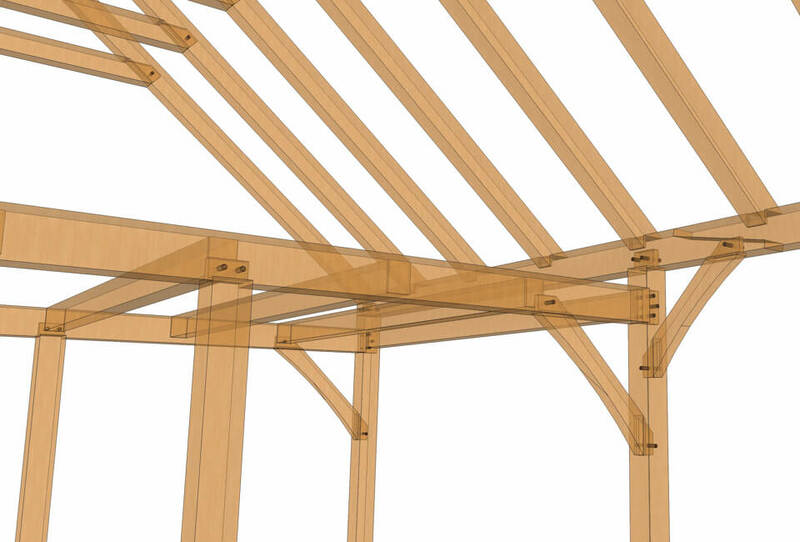 Frame out or use preconstructed panels?